While the sun has yet to set on the 2008 waterfowl season, your favorite manufacturers have already released the newest, greatest gear you’ll daydream about until the 2009 opener. Go on, take a peek. Scratch that itch. Technically a 2008 release, the M-2 slipped under everyone’s radar and didn’t get the publicity it deserved when it debuted last November. Featuring a 900D Duramax weather-proof cover, zippered flag ports, see-through mesh face flaps and stubble straps, the M-2 weighs 22 pounds and folds into a backpack for easy hauling. With its padded seat and 19 ¾-inch setup height, you’ll enjoy a low profile in comfort. Mossy Oak Duck Blind ($1,339 for the 3-inch model; $1,499 for the 3 ½-inch model). Offered only in waterfowl-busting 12-gauge, 3- and 3 ½-inch models, the all-new Browning Maxus is a duck and goose hunter’s dream. Reduced recoil and up to 44 percent less muzzle jump allows for quicker, more accurate follow-up shots, while the Vector Pro lengthened forcing cone provides a more uniform, consistent pattern. A new gas system with large exhaust ports dumps gases from heavy loads faster and features a 20-percent longer piston stroke to reliably eject light-load shells. Throw in a revolutionary forearm that allows for quick breakdown, a plug that can be removed using a vehicle’s key and a speed loading and unloading system and the Maxus might be the only gun you ever take into the blind again. Why just buy a sweet shotgun when you can also buy the matching jacket? 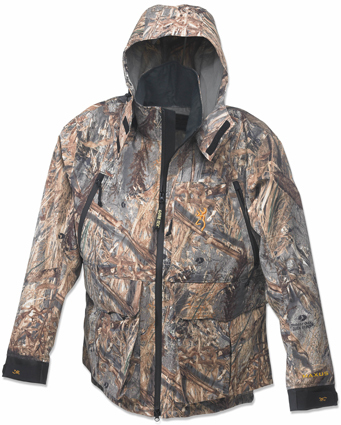 The new Maxus Jacket uses Gore-Tex’s “Comfort Mapping” technology to strategically place various fabrics where they’re needed most. By breaking the body into different climatic zones, rugged, warm Gore-Tex soft-shell fabric is used in areas requiring more protection such as shoulders, while lightweight Gore-Tex Paclite fabric is used where less weight and bulk are preferred—like in the lower torso and under the arms. Available in Mossy Oak Duck Blind camo, it features an articulated elbow that prevents binding during gun mount. A detachable hood keeps ducky weather at bay while the Maxus’ upper handwarmer pockets and lower pockets with hook-and-loop secured flaps provide ample storage. FA’s new Eliminator Cargo Blind just did away with one of the most cumbersome aspects of duck and goose hunting—getting all your gear to the setup spot in a single trip. 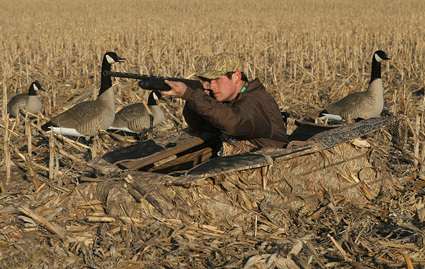 The layout blind doubles as a dolly that can carry four-dozen silhouettes or more than 200 rag decoys, plus your gun, flags and other gear. Built on a lightweight, collapsible aluminum frame, the ECB has attachable, oversized wheels that can roll over the harshest terrain. 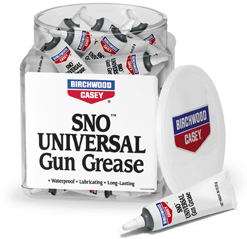 Constructed of durable 600-denier poly fabric with a waterproof PVC coating for extra protection, the blind insulates against the cold ground with ¾-inch closed-cell foam. The blind features flagging holes on each side, a padded head and gun rest, built-in gun scabbard, stubble straps and the original FA double lid system. 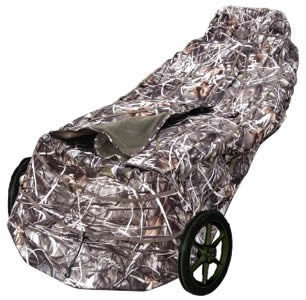 Available in Advantage Max 4, Mossy Oak Duck Blind and FA Prairie. At 21-inches, these life-size shell decoys combine awesome detail and convenient transportation and storage. The Rester Pack features Rester and Semi-Rester with swivel heads while the Sleeper Pack features attached heads for durability and faster spread placement. The Rester Pack contains 6 resters and 6 semi-resters while the Sleeper Pack contains 12 with attached sleeper heads. Unlike conventional flashlights that produce a circular, usually irregular pattern of light, the Bushnell HD Torch projects a perfectly square and uniform beam of light that is consistent from center to edge without dim areas or doughnuts of light—perfect for those pre-sunrise jaunts to the blind. 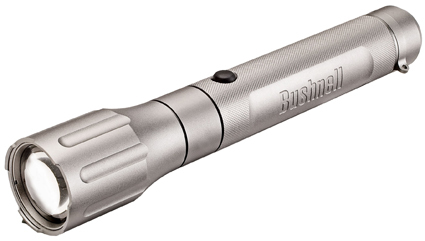 Constructed of aircraft-grade aluminum, the Torch produces 165 Lumens of light with its powerful LED bulb. Run time is 1.5 hours and is powered by two 3-volt lithium batteries. There are two operating modes: high and safety-strobe for emergency use. The HD Torch includes a “Find Me” feature—a glowing “B” rear button that also serves as a battery life indicator. It comes with two batteries and a lanyard. 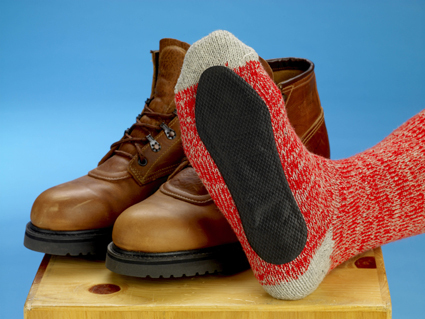 Air-activated foot warmers that feature an adhesive on one side so that you can stick them to the bottom of your sock, Tosti Toes provide up to 9 hours of heat in each thin insole. The season might be over, but you can still show your enthusiasm for duck hunting while helping to support wetlands conservation with the DU 2009 calendar. 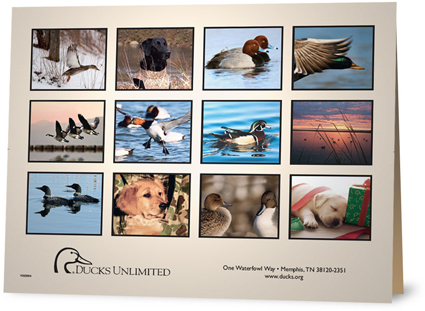 Incredible photos of ducks, dogs and breath-taking scenery, the calendar will help get you through those long July days.